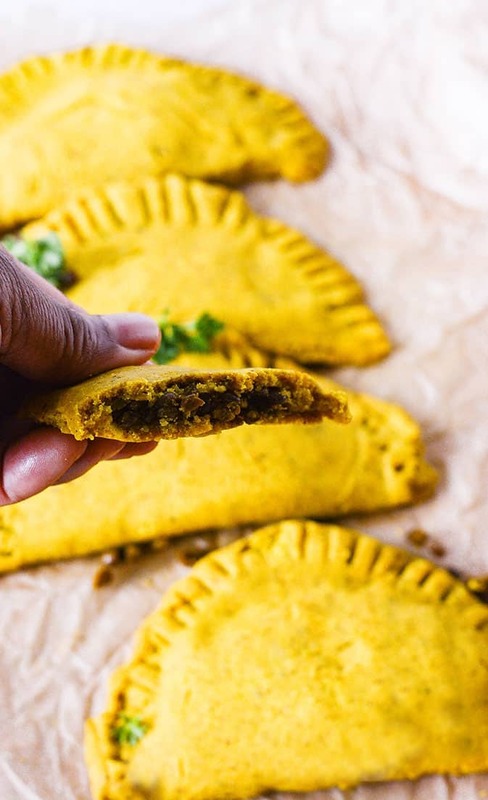 These flavorful Jamaican Lentil Patties is a gluten-free and vegan version of the very popular Jamaican beef patty. Savory lentils cooked with aromatic herbs and spices in a buttery pastry. 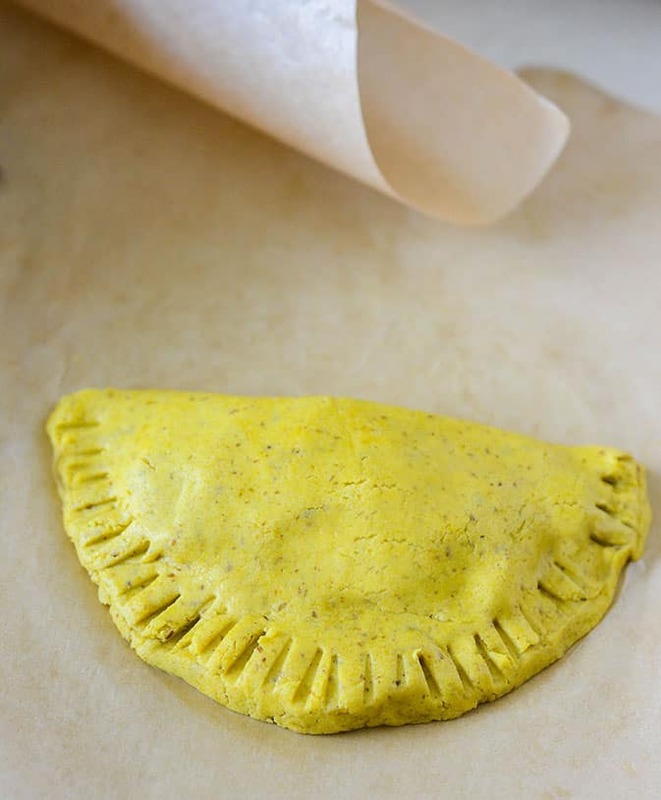 Jamaican Patties would be considered the Jamaican fast food. In this version, I used lentils instead of ground meat and placed in a gluten-free and vegan crust. The taste is right on and very flavorful. I added curry powder to the crust for that signature golden color. Note updated Nov. 15, 2017 : I have worked long on hard on this recipe, originally I wanted to use only ingredients that can be found worldwide but this is the best version so far with a gluten-free crust from scratch that comes together, just last night I had a close friend who is also Jamaican try it and she was blown away by the results and wanted the recipe. I used Earth Balance Vegan Buttery Spread that gave the dough a buttery flavor. By all means, use your favorite crust with this recipe, the filling is the best vegan filling you will ever find!!! I have also seen amazing photos and reviews of this recipe using regular all-purpose flour in Facebook Groups and on Pinterest. Don't expect this gluten-free crust to be super flaky like traditional all-purpose flour crust, gluten-free dough lacks gluten, the elasticity that makes dough stretchy. So scientifically speaking it is impossible to be as flaky. 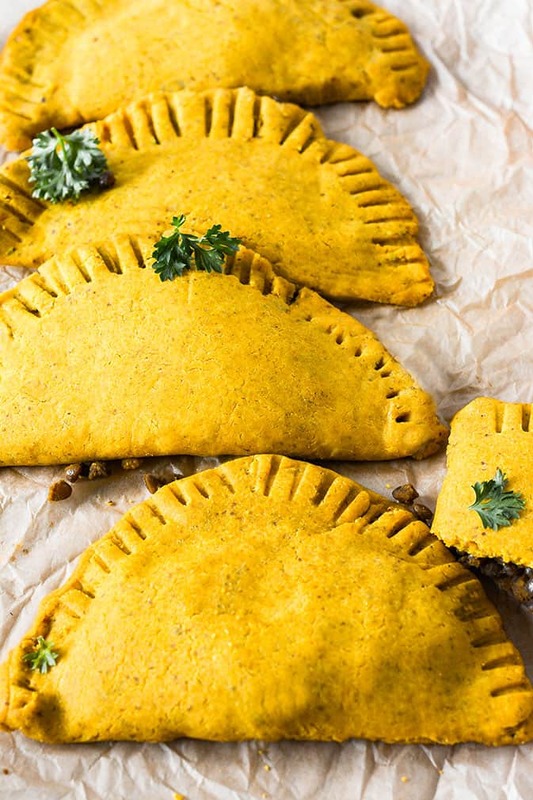 I have been meaning to do a step-by-step recipe on how I make my vegan and gluten-free version of my Jamaican Lentil Patties. Working with gluten-free dough is pretty tricky because you are working with a dough that has less elasticity than regular wheat flour dough. Making gluten-free dough is not the same as using regular flour, but it can be pretty close! I don't add xanthan gum to my dough but you can add 1 teaspoon to the recipe. 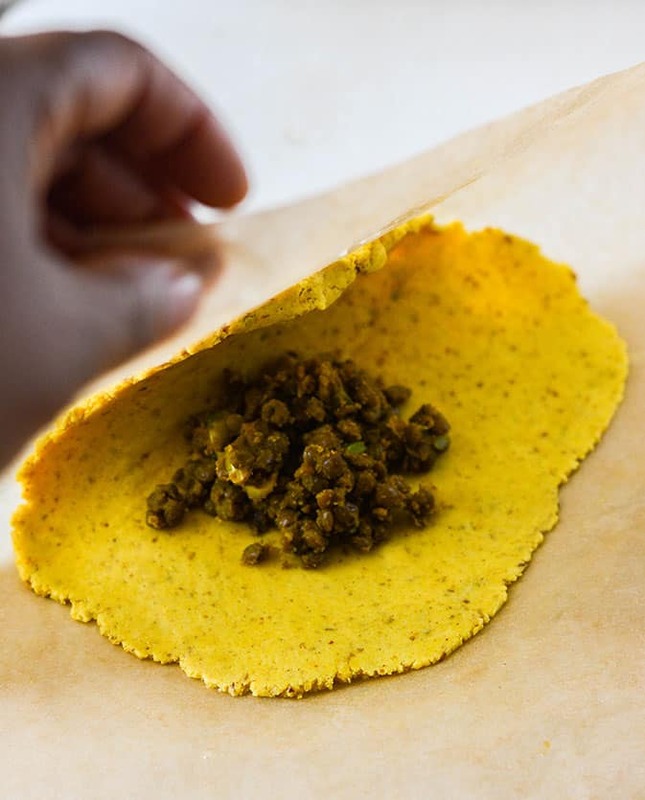 I roll the dough in a circle in between parchment papers, then I added the seasoned lentils Fold the dough in half over the lentil filling with the parchment paper. 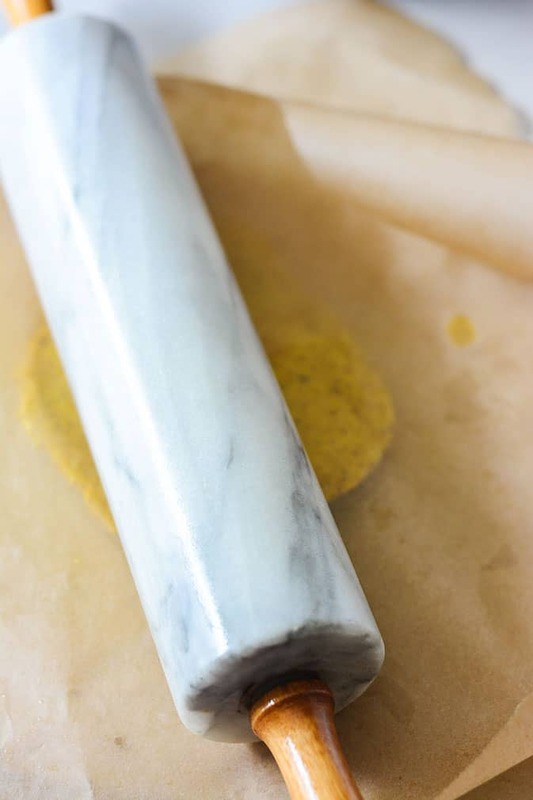 It is so much easier to work with the dough when it is placed between sheets of parchment paper and rolled using a rolling pin. Remove the top sheet, add the filling and fold the bottom sheet over, as shown above, Seal edges and crimp with a fork as shown below. I love to use ground flax-seeds as the egg substitute and oat flour as gluten-free flour. You can substitute with brown rice flour, sorghum or millet flour. I also added tapioca starch and potato starch as a binder. Obviously, these patties are not the same as traditional beef patties but they are the best and most flavorful you will find that are gluten-free and vegan. I know I'm repeating myself, if you aren't on a gluten-free diet, just substitute the crust with your favorite crust, puff pastry or even pie crust. If you don't have potato starch, you can blend the liquid in the recipe with potato. 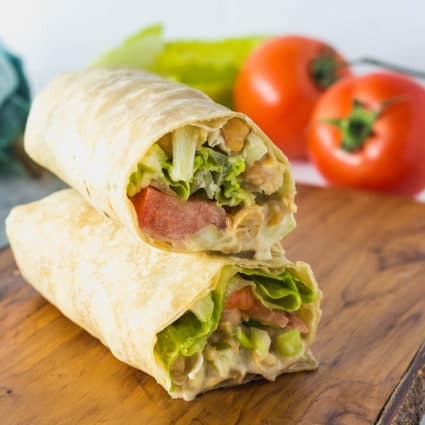 The filling is so flavorful it is truly worth it. If you are on a gluten-free and vegan diet, I know you can relate to me because there are so many of your favorite recipes that you have to give up due to agonizing reactions to gluten. So I'm excited to experiment with recipes that you can still enjoy. For the people who have reactions to even gluten-free oat, use a combination of brown rice flour, sorghum flour, tapioca starch, potato starch as a substitute. 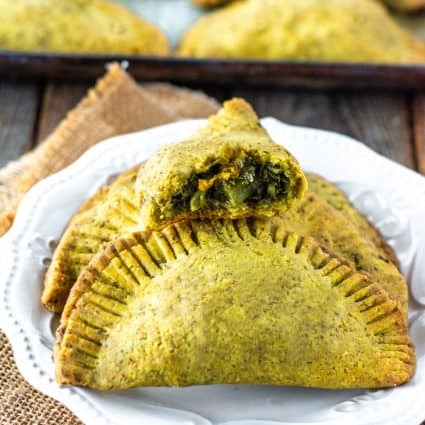 Updated: February 2019: I have since experimented and found this crust in my Jamaican Callaloo Patties to be flakier and more like traditional Jamaican patty crust, however, it has a higher fat content so it is not for anyone who is on any dietary restrictions. Heat oil in a medium saucepan over medium-high heat. Add onion, spring onion, and garlic and saute stirring constantly until onion is soft. About 3 minutes. Add thyme, turmeric, paprika, cumin, allspice, lentil and stir to coat. Add water or broth and bring to boil. Cover saucepan and reduce heat to simmer for 30 minutes until most of the liquid has evaporated and lentils are tender. Stir in liquid aminos, cayenne pepper and salt to taste. Remove from heat and allow to cool while preparing the crust. Preheat oven 400°F. Line baking sheet with parchment paper and set aside. 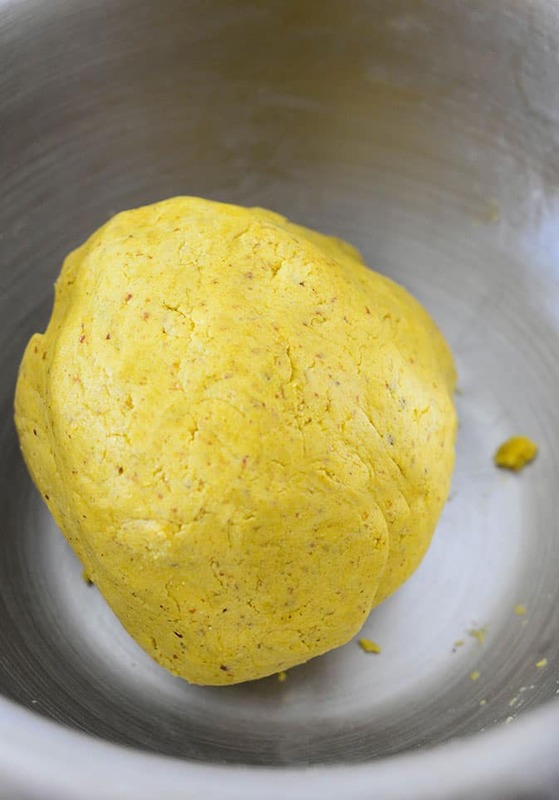 Stir in vegan butter until the dough resembles crumbs. Stir in almond milk and use hand to form a dough ball. Further divide ball into 8 smaller balls. Roll out each ball in between 2 parchment paper sheets using a rolling pin, about a 4-inch circle. Remove top layer sheet, add 1 tablespoon of lentil filling on one half of circle, making sure to leave edges clear. Fold over the other half, by folding parchment paper and seal crimping edges with a fork. Transfer to baking sheet. Repeat with remaining dough. Bake for 20-25 minutes or until golden brown. Could you use this recipe to make steamed buns instead of baking? That’s a great idea Grinner, the filling would be spot on, but not certain about the crust since steamed buns are usually made with yeast bread. If you do please let us know how they turn out. Katherine, I’m so happy you enjoyed it. Thank you for leaving your feedback. Is there an oil free sustitute for the earth balance? Unfortunately there isn’t, the only thing I can think of is substituting the vegan butter for a nut butter but the outcome will not be the same. That’s wonderful, I’m so happy you are enjoying my recipes Cherese, I appreciate your feedback it is so encouraging! This recipe is a dream come true, as I’m a vegan who has to be gluten-free! :-) Thank you so much — can’t wait to try it. Hello Chessie, hope you enjoy. Wow never heard of it but I”m going to Google it and I’m happy it is similar. Do you know how many servings this makes? AriYanna, I made 8 patties and it all depends on the size you make. I’m not a nutritionist so I just plug the numbers in nutrition calculator like myfitnesspa. Coconut aminos as well, if you don’t consume soy. I appreciate the GF Vegan recipes , made the beef patties and the filling was amazing. My dough was really dry , when rolling them into balls and afterwords eating them. What can I add to make it more moist or flakey? more water? Hello Samantha, thank you for making my lentil patties recipe. You could play around with reducing the starches by half and substituting it with almond flour and see if that makes a difference. Make sure the dough is moist, not dry and looks exactly like the photo where it comes together in a smooth ball, I haven’t tried the substitution with the almond flour as yet though. Tanshania, soy sauce can be substituted. Hello! Do you think I could make the pies in advance and stick them in the fridge or freezer and bake when I’m ready to eat them? Or perhaps the freezer? Any success either way? Or do I need to keep the crust and lentils separate until ready to bake. Thanks in advance! They freeze well Abbie, hope you enjoy! And does baking time remain the same? Do I need to pull them out in advance or directly from frozen to baking? Thanks! I would pull it out in advance and allow it to defrost before baking or I actually would bake them first, then freeze until the day you are ready to serve. Remove from the freezer, allow to defrost in the refrigerator and then pop them in the oven for about 20 minutes in a preheated oven to heat oven, then serve immediately. I was surprised how satisfying these were. My whole family loved these! We’ve made them twice now. Great work on this recipe! That’s so cool, I’m happy your entire family loved them Karen, thank you for your feedback. I want to try these tomorrow. Can i use brown rice flour and white flour? Have you tried this with coconut oil in place of the vegan butter? Can I assume it would work? Meagan I have and it worked but not as good. I had a recipe up with the coconut oil but I remember the patties were drier. Can I use a classic white flour? That’s the only type of flour I can access and I know the recipe will not be gluten free, which is not needed for me. Hoping for a quick answer ! Lauralie, yes you can use white flour. Hope you enjoy and please let me know how you find it! What’s the tool you used to mash the bitter into the dough? I would like to purchase one of those. Rubeana, it’s a pastry cutter. Hello Jordanna, welcome to my page I’m happy you are here. I hope you and your hubby enjoy my recipes, yes Lloyd is my brother, I’m happy he introduced you to my website, he is an exceptionally good plant-based cook. OMGeeeeeee I love you!!! I have Celiac’s and lentils are my favorite! Gonna make this tonight! YAY! Kim, you are too sweet. I hope you enjoy them! Thank you so much. 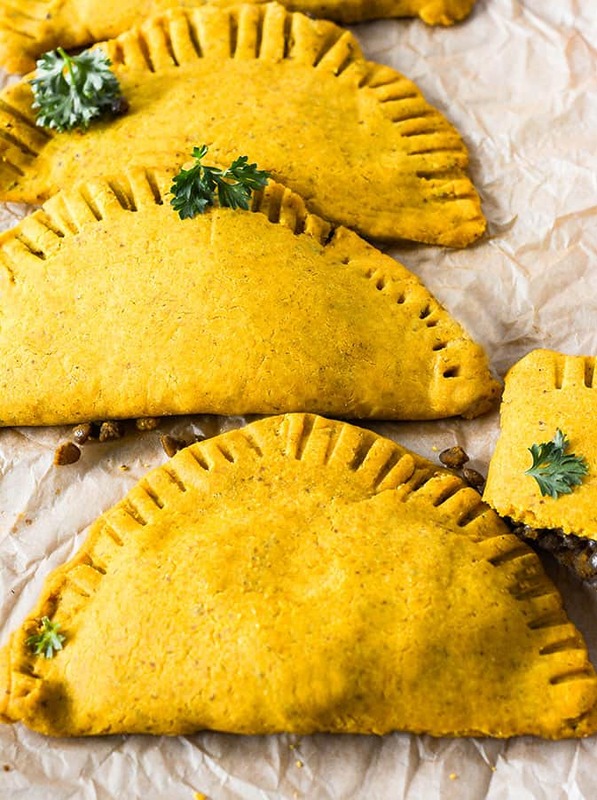 My husband grew up on Jamaican meat pies and with his choosing to be vegan and me being celiac and vegan we are thrilled with this recipe ? Leanne, hope you and your hubby enjoy this recipe. I’m so happy to share my recipes.